Note from her partner: I'm a dog handler with West Jersey K-9 SAR. My retired partner, Morgan, will be fourteen this year. She's still active and healthy aside from a little arthritis here and there and having lost her hearing. At 13 1/2 though every day together is especially precious now. For a little background on my girl, she is a black and white tri English Springer Spaniel. She's a good girl. She's certified in air scent, water and human remains detection. She has been on a lot of searches in her career, including 9-11 and hurricane Katrina. I painted Morgan tired, happy and dripping with mud and water, her favorite way to be. Morgan was one of the winners of the of the seventh AKC Awards for Canine Excellence (ACE), presented by the American Kennel Club. The award isdesigned to commemorate loyal, hard-working dogs that have made significant contributions to their community. The ACE awards are given annually to dogs in each of the following five categories: Law Enforcement, Search and Rescue, Therapy, Service and Exemplary Companion Dog. Search and Rescue Dog: “Morgan” from Lebanon, N.J.
Morgan, an English Springer Spaniel, is a certified wilderness air scent, water and cadaver search dog. She and her owner, Katrene Johnson, have participated in over 50 searches nationwide. In September 2001, Morgan and Katrene were called upon to search for DNA material in the debris from Ground Zero. Morgan faithfully searched the quarter square mile of debris that had been deposited at Staten Island’s Fresh Kills Land Fill. Her contribution helped to give numerous families the answers they sought about their loved ones. In 2005, Morgan was instrumental in the relief efforts of another catastrophe. Hancock County, Mississippi called upon search and rescue teams to help track down their missing citizens after the devastating effects of Hurricane Katrina. Morgan and a few other teams were responsible for clearing neighborhoods before residents returned to survey the damage to their homes. With Morgan’s help, Hancock County completed its mission of locating all missing citizens. 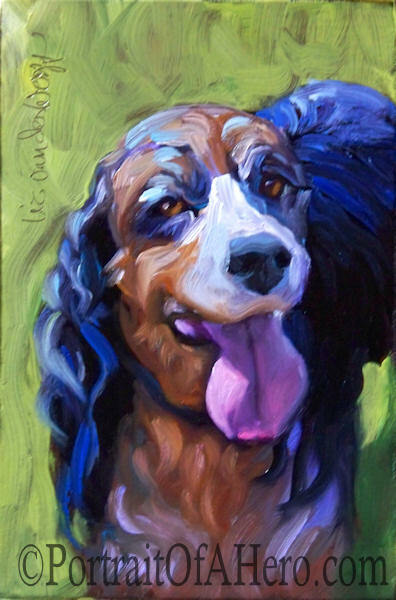 If you are a member of Search & Rescue, K-9 or Mounted Patrol, please allow me to paint a small portrait for you at no charge, in gratitude for your service.